Imagine a Hawai'i where our streams were clean, valleys lush with native forest, and oceans teeming with coral reefs and healthy fisheries. One where the preservation of our islands natural resources were a top priority that benefited our local economy. Imagine a Hawai'i that was 100% powered off of renewable energy and locally grown food was abundant. A place where whatever is taken out of the environment was put back in, all of our waste was recycled or reused, and the pollutants from our urban society were carefully managed so as not to ever disrupt the natural environment. Now imagine a Hawai'i that put the needs of local people first. A society where agriculture, renewable energy, education, science/technology, and the arts drove our economy. Imagine communities where people were healthy and culture thrived while tourism was aimed at offering visitors an authentic experience of modern day Hawaiian culture at levels sustainable by our local communities and infrastructure. This is the type of Hawai'i that we dream of and our overarching goal is to do whatever we can to make this vision a reality. We don't have all the answers nor do we know what the future holds. What we do have is a deep sense of Aloha for our home and the desire to help make a change. For us, that change starts in our own backyard, working with the people around us. If we can make a difference on that fundamental level and help more people share this vision, then we believe anything is possible. We want to open ourselves to working together with local businesses, non-profits, and grassroots community organizations to help better connect communities and the economy to the environment & culture. Nelson Mandela once said that "Education is the most powerful weapon which you can use to change the world." Maunalua Bay is our place based educational site to encourage students from the Maunalua region and beyond to become involved with environmental restoration efforts in their own backyard. In the 21st century, so much of what we do and how we communicate depend on high quality media production. 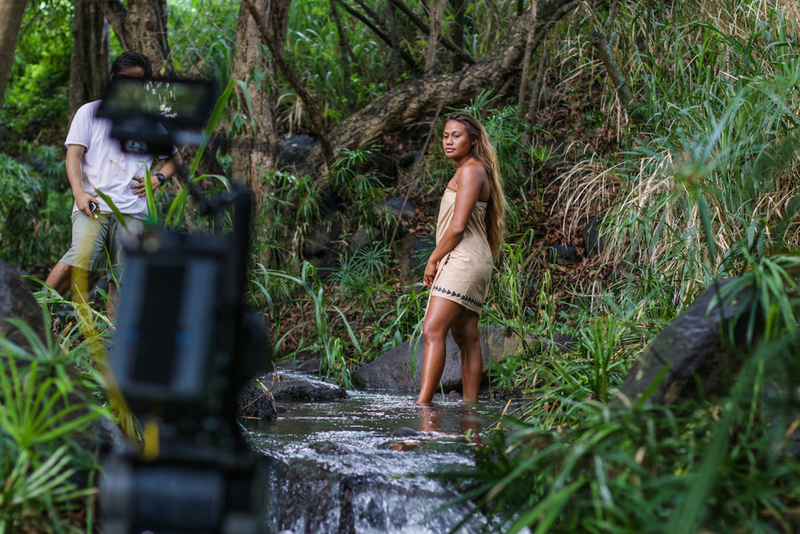 Whether it's photography, film, or written pieces, we strive to create professional content that brings awareness/understanding and is engrained in contemporary Hawaiian culture. Austin Kino is born and raised in Aina Haina. He attended Kamehameha and has a Bachelors degree in Business Administration with a concentration in Entrepreneurship and Finance from Point Loma University in San Diego, California. Since 2006 Austin has served as a volunteer with the Polynesian Voyaging Society where he has undertaken the role of an apprentice navigator on three of the recent legs of the Malama Honua Worldwide Voyage in 2015. Having previously been employed with the Malama Aina Foundation, Austin served as the Project Coordinator of the Ho’opili Program. The Ho’opili Program was awarded an ANA Federal Grant that served middle school children in Hawaiian Focused Charter Schools on the islands of Kauai, Moloka’i and Oahu combining recent Common Core and Next Generation Standards with hands field day activities in the categories of Makahiki Games, Taro Lo’i, Loko I’a Fishponds, and Hawaiian Sailing Canoes. Jesse Yonover is born and raised in Hawai'i Kai. He attended Mid-Pacific Institute and has a Bachelors degree in Environmental Studies from the University of Colorado where he also spent a semester studying abroad in Lisbon, Portugal. In 2014 he graduated with his Masters degree in Pacific Islands Studies from The University of Hawai’i. For the past 3 years he has worked as a Marine Resource Coordinator & Community Liaison in Maunalua Bay. Jesse also has a passion for music & film and started his own media promotions company that runs a popular music/multi-media blog and cinematography campaigns for the Hawaiian Reggae band, The Green. In the realm of education, he has spent time as a summer school teacher through the Punahou Pueo Program (summer school program that provides low socio-economic background but high academic potential public school students with the opportunity to attend Punahou summer school) and as a mentor in the Mana Mele program to guide students in the art of filmmaking. Aside from his career, Jesse is an avid watermen who loves the outdoors and traveling. Ryan Miyamoto is born and raised in Kuliou'ou. He attended Kamehameha and has a Bachelors degree in in Television, Film and New Media from San Diego State University. He is currently a Cinematographer, Director, and Producer based in Los Angeles, California who found a passion for film through surf cinematography. Ryan's work can be seen on National Geographic, Discovery Channel, ABC, CBS, NBC, Fox Sports, ESPN, Disney and Red Bull Productions. Beyond cinematography, Ryan has worked as a 3-D assistant editor on Shrek and Shrek2, and as an underwater camera assistant for Chasing Mavericks and Point Break (2015). His Directorial debut Twinsters, premiered at SXSW 2015 and received the “Special Jury Recognition for Editing.” Current work includes NBC Sports Spartan Race 2016, NBC Sports Winter Dew Tour 2016, Fox Sports Titans of Mavericks 2016 and ESPN's NBA Eastern Conference Finals. A Movement to Redefine Environmental & Cultural Education, Stewardship, & Sustainability. We take on a limited amount of projects each year but we are always interested in working with groups who align with our philosophy. Feel free to contact us if you would like to inquire about working together. 1. Get educated & get involved. 2. Follow us on Instagram & subscribe to our newsletter to stay up to date. 3. Donate. Its helps our business have more resources to bring our vision to life. Please email us if you want your donation to be tax deductible.